While every guitar has a unique sound, not every musician is able to fully expand upon the personal idea with just their guitar and an amplifier. If you’re really looking to develop and expand upon your own unique sound, a guitar pedal is going to be the next guitar accessory you should invest your money in. The only trouble is that there are literally dozens of new boutique guitar pedal companies popping up every year, releasing new types of pedals and trying to beat out the tried and true guitar pedals that the most famous musicians depend on. As someone who is a guitar pedal beginner, where do you start your search for a pedal that’s really going to work for what your dream sound is? The first step in your journey is going to be learning about all of the different pedals out there and what these different pedals all do, so you can gain a better understanding of what you’re actually looking for. What’s really crazy to think about is that all of these above pedals each have a different purpose, helping a musician to create their own unique sound. What is a distortion pedal? A distortion pedal is the most commonly used pedal, partly due to how useful this pedal can be when used properly! In a short summary, the distortion pedal takes the natural signal of your guitar and contrasts it; this pedal takes your guitar’s signal and adds volume, sustain, crunch, and distortion to your sound. A lot of times, inexperienced musicians will accidentally mislabel a distortion pedal for an overdrive pedal or a fuzz pedal (although if you listen closely enough, there are differences between the three pedals). The Electro Harmonix Nano Big Muff Pi is a distortion pedal that has a huge impact on the music industry, but the Electroc Harmonix Nano Big Muff distortion pedal is the compact version of this historical distortion pedal, making it a lot easier to control and work with than the original. The Nano Big Muff distortion pedal features a sleeker design than its parent, but has three controls, an incredible range, lots of gains, and provides musicians with the ability to control their sound with a soaking distortion to a modest distortion with the simple ease of a knob. What is an overdrive pedal? Although the difference may not be drastic to the untrained ear, an overdrive pedal pushes your guitar’s signal harder, whereas a distortion pedal completely alters the sound your guitar is producing. The use of an overdrive pedal will help you to preserve the original sound of your guitar and amplifier and actually forces the amplifier to produce a thicker, more abundant signal. Overdrive pedals are typically paired with valve and tube amps, as the pedal helps to push the tube to their full capabilities, which in turn highlights the distortion that tube amps are popular for. 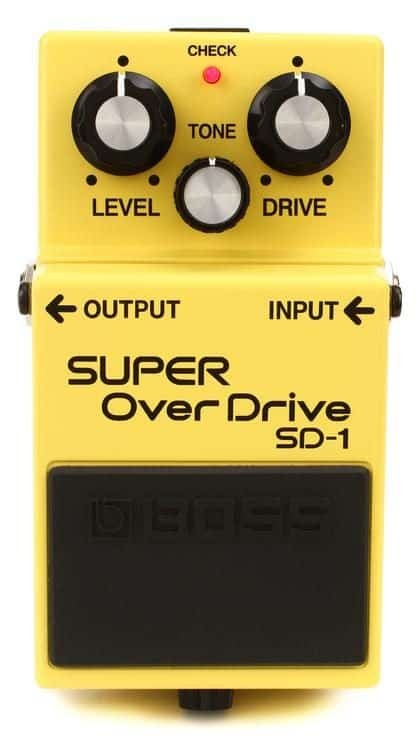 The Boss SD-1 Super Overdrive pedal doesn’t have any bells and whistles to it in terms of the controls and features it has, but it’s a very affordable pedal. Boss SD-1 is an amazing pedal to lean on if you’re in the need of a standard, balanced overdrive pedal while working with an extremely limited budget. What is a fuzz pedal? Fuzz pedals are often confused with a distortion pedal, although the sound that a fuzz pedal helps to produce is very different than the sound a distortion pedal produces. Fuzz pedals are a lot edgier and help to push your amplifier to the point where it’s going to sound like your amp is getting ready to explode. Fuzz pedals are a lot nosier than both distortion and overdrive pedals are, which is part of what makes fuzz pedals so much more distinct than the above-mentioned pedals. EarthQuaker Devices Hoof was inspired by the world-famous Green Russian Big Muff Pi, but capable of so much more versatility and magnitude than the Green Russian Big Muff Pi was ever capable of. With the selection of reciprocal controls available, the Hoof fuzz pedal gives musicians an enormous selection of options for tone shaping. Before committing to a purchase of a reverb pedal, go give your amplifier a once over and see if it has a ‘reverb’ control pre-installed on it. If it does, you don’t need a reverb pedal. On the chance that your amplifier doesn’t have a reverb pedal, you may want to take some time to read into what a reverb pedal could do for you. A reverb pedal isn’t anything too fancy (for those of you who are interested in using a simple pedal); all a reverb pedal does it gives your sound an echo effect. Spring: Produces vintage amp style verb, most commonly associated with surf or rockabilly music. Room: Simulates the natural sound of an acoustic space, best used for slap-back echoes. Hall: Produces the same type of reverberation that you hear in large concert auditoriums or halls; most commonly used for long decays, a desire for a large sounding reverb, and/or unique reflections. Shimmer (pitch-shifted): Known for producing an unnatural ambiance, also referred to as ‘heavenly’ reverb. The Dr. Scientist The Atmosphere Reverb Pedal is certainly an eye-catching reverb pedal, but the multi-reverb effects that this pedal offers makes it a wonderful investment. The Atmosphere pedal offers several classic reverb styles, such as a plate, spring, hall, and room, as well as a few others. There are also several hybrids reverbs available on this pedal, including pitch, filtered, bit-crushed, modulation, as well as a couple of other hybrids. This is a really great pedal to have if you want to play around with a huge selection of reverb effects! What is a chorus pedal? Chorus pedals are always fun to play around with because they make your instrument sound like there is literally a chorus of other guitarists playing the same exact thing as you are. It almost sounds like a game of ‘Simon Says’, as with the chorus pedal it sounds like there are other guitarists playing the same thing, but just a little bit out of time with you, on a completely different guitar. With the help of a chorus pedal, your bass line is going to be a lot more noticeable and your overall sound a little more sing-song. 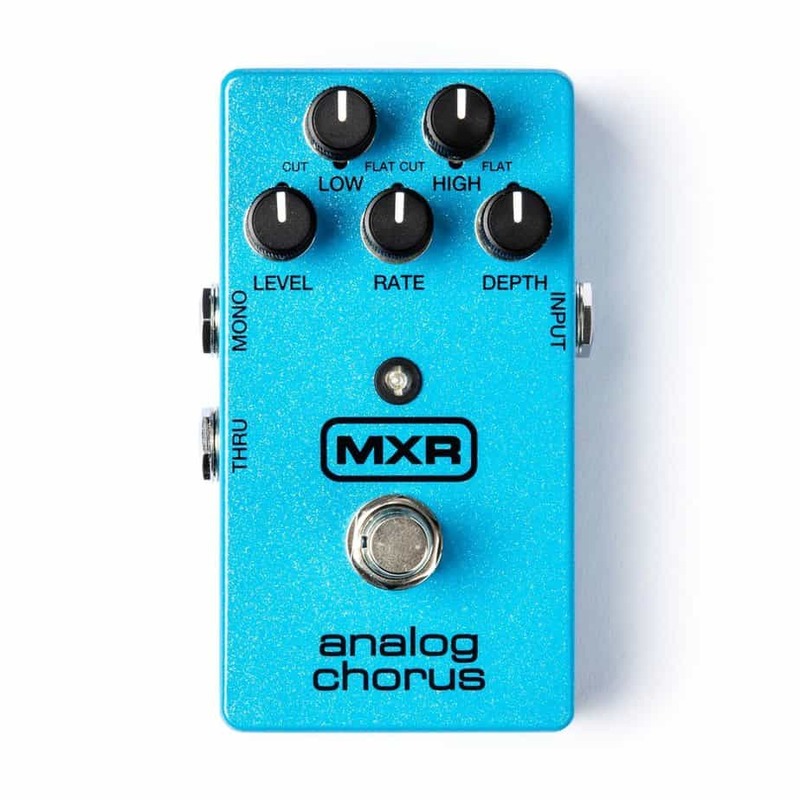 The MXR brand is one of the world’s most famous chorus pedal manufacturers, so it’s no surprise that the MXR M234 Analog Chorus Pedal is still an all-time favorite by musicians all over the world in 2019. The Analog Chorus pedal has incredible flexibility and is completely analog, which provides musicians with a lot of depth and warmth. While this isn’t a pedal that many people would consider ‘budget-friendly’, the creativity that this chorus pedal encourages is certainly worth the investment! What is a boost pedal? A boost pedal grows the strength of the signal that’s going into your amplifier, which means you won’t have to use distortion to make your sound instantly noticeable. Instead, a boost pedal adds to your guitar’s signal without adding or altering distortion or making your amplifier produce a grittiness. The MXR M133 Micro Amp is another simple, no-nonsense effect pedal that comes in simplistic, compact packaging. A lot of other boost pedals in the market get lost in trying to have flashy, excessive features, which is part of what makes the M133 Micro amp one of the best boost pedals on the market (not to mention, it’s super affordable). A flanger pedal operates in a similar manner to the chorus pedal but creates more of a swooshing effect, which is more noticeable on the flanger pedal than it is on the chorus pedal. While Electro Harmonix is most well-known for creating analog pedals, the Electro Harmonix Stereo Electric Mistress pedal is one of their best-selling digital pedals. Even if you are someone who is a die-hard fan for the sound of an analog pedal, the Electro Harmonix Stereo Electric Mistress pedal produces a tone that isn’t easy to nail as analog or digital. Plus, the stereo output and the built-in chorus that this pedal has makes it a really great bonus to your pedalboard! A Wah pedal (no, that isn’t a typo) creates a ‘wah’ noise, hence the name of the pedal. 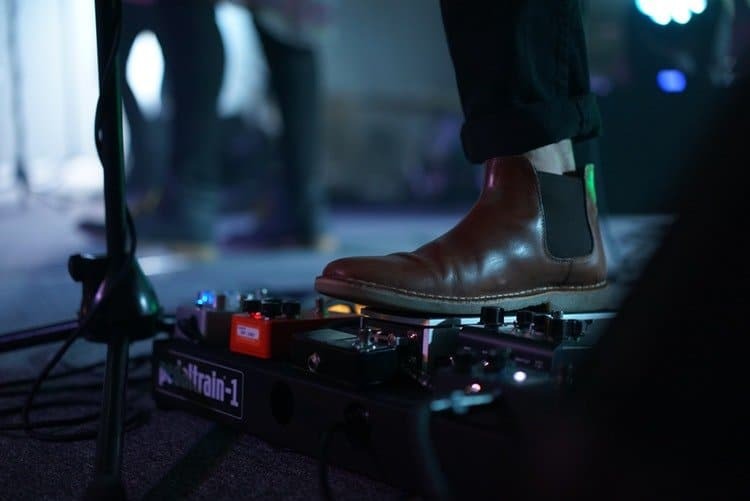 It’s a pretty simple effect, but if you’re looking to play a lot of funk or old school rock, a Wah pedal is going to be a pedal you’re going to spend your time looking at. This Dunlop GCB95 Cry Baby Wah pedal was the pedal used by all of the super famous rock stars back in the ’80s (Hendrix and Gilmour just to name a few), but is still commonly used by a lot of funk and rock musicians to this day. The solid construction and adaptability of this Wah pedal is a huge reason for what still makes it such a highly sought-after pedal in modern music! What is a delay pedal? A delay pedal will take the signal that your guitar produces originally and delays it, but then plays it back how the pedal received the signal the first time. You will most commonly run into Digital Delay pedals and Analogue Delay pedals; Digital Delay pedals offer a longer delay and a cleaner sound, while the Analogue Delay peal offers musicians a subtle change in the original sound. 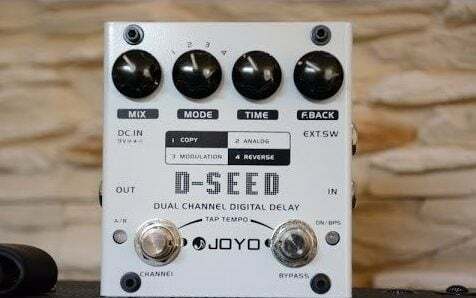 If you’re on the hunt for an outstanding delay pedal, the Joyo D-Seed Dual Channel Digital Delay is built for abuse and jam-packed with controls, giving musicians the chance to truly transform their sound. Not only does this D-Seed Dual Channel pedal comes with the standard delay effect, but you’ll also find that it has several channels and other features like Tap Tempo. As an added bonus, you can also add an expression pedal to this digital delay pedal, which would allow you to control the delay pedal through the expression pedal! How cool is that? What is an EQ pedal? The purpose of the EQ pedal is to allow a musician to take away or to add to specific layers of their sound. If you want to remove your bass line, boost your middle, or only feature the treble line of your sound, the EQ pedal will allow you to do so. EQ pedals can be tricky to work with, so I would only recommend this pedal for guitarists who have some experience playing around with pedals. If you’ve done a lot of research on EQ pedals, you may have seen the brand name ‘Empress’ constantly popping up in ‘suggested buys’ or comparison reviews, as the Empress Para EQ pedal is one of the most raved-about EQ pedals on today’s market. Not only will this Para EQ pedal withstand all of your dropping and stomping, this EQ pedal uses a three-band parametric EQ to provide musicians with total control over a distinct frequency range. So, not only does the Empress Para EQ pedal give you nearly an endless number of possibilities, but this Para EQ pedal can also be used as a boost pedal! What is a phaser pedal? A phaser pedal has a similar purpose to the chorus pedal, as both the chorus and the phaser pedal will thicken up your sound a little bit. However, the phaser pedal adds a ‘spinning’ effect to your sound, so when you’re running your signal through a phaser pedal, it’s going to sound like your sound is spinning around. With a phaser pedal, you’ll have the ability to change how quickly this spinning motion moves your sound. This phaser pedal is a modernized version of a classic phase pedal, but also allows musicians to easily switch between a modern voice or a vintage voice. With a simple single knob operation, this MXR EVH90 phaser pedal also has a revamped box, making it small and sleek enough to fit on most modern-day pedal boards. What is an octave pedal? An octave pedal will listen to the note that you’re playing and play the octave of that note (up or down, depending on what you have the pedal set to). This makes it sound like there’s something playing octaves with you while you’re playing; an octave is a distance between a musical note and the corresponding note at a lower or a higher pitch. One really cool thing about octave pedals is that on some pedals, there is the option for you to have the pedal play both the higher and lower octave at the same time! The Electro Harmonix Pitch Fork octave pedal has a pretty simple exterior packaging, but the plain design on this octave pedal on the flexible circuity that allows musicians to move your pitch in five different directions and in several interval transpositions. In terms of the octaves available, there are six different directions that octaves can move (three up, three down), but this pedal will move in five different directions because you’ll already be playing on the octave. What is a tremolo pedal? A tremolo pedal will take your signal and will make your sound’s volume lower or raise at a rapid pace. In other words, the tremolo pedal allows musicians to change the pace of the fluctuation of your volume, as well as how severe the drop and increase of volume is. If you’re not exactly sure where to start on your tremolo journey, the Diamond Pedals tremolo pedal is going to have every type of tremolo you could ever want or need! This tremolo pedal allows a musician to choose between shark fin, sine wave, chop, and square wave waveforms, which are all obtained with the help of a microprocessor. But that’s not all that this pedal has to offer! You can also control the depth, volume, timing, and speed of the tremolo, which allows you to control how the tremolo this pedal produces fits into the song you’re playing. There is also a LED light on the pedal that flashes that keeps time with the tempo! What is a looper pedal? To break down the purpose of a loop pedal, you’ll need to imagine a song where to guitars are playing together at the same time. If you’re looking to layer your sound, with a chord progression playing on top of a rhythmic pattern, you’re going to want to look into getting your hands on a looper pedal. It’s a really fun pedal to play with, but it’s also a helpful tool to use if you’re looking to hear back through an amplifier the sound you’re creating/putting out. The memory on the Boss RC-30 Phrase Looper pedal is especially impressive, with a three-hour stereo limit, but also have 99 onboard memory phrases that allow you to store loops. In addition, this looper pedal also have twin pedals and is a multitrack pedal, also has volume faders! What is a tuner pedal? No matter what your skill level, if you’re looking to get into using guitar pedals, a tuner pedal is an absolute must-have for your pedal board. Pedal tuners are wonderful to have around if you’re someone who plays a lot of live gigs and is looking for a way to instantly and accurately tune your instrument properly or even alter your original tunings! The Boss TU3 Chromatic Tuner is suitable for both bass and electric guitars, that has a high brightness (glare-free) mode to increase your visibility when you’re playing outdoors. The Boss TU3 Chromatic tuner has modes for both six string and seven-string guitars, with an extra mode for supporting drop tunings. What is a noise gate pedals? A noise gate pedal is really handy to use if you’re playing on an amplifier or a guitar that has high gain; chances are that when you’re playing (or when you’re not playing), you hear your instrument or your amp buzzing. A noise gate pedal stops your signal when you’re not playing your instrument, which stops any noise from getting through your amp until you pick up playing again. This Boss NS-2 Noise Suppressor pedal isn’t the prettiest noise gate pedal around, but it does feature a threshold and a delay knob, which provide musicians with the ability to eliminate and shape their tone. There are also four jack inputs on this pedal, including input, send, output, and return! A compressor pedal helps to take all of the notes that you’re playing and compress the different dynamics that each note comes out as all down to one volume. In other words, if you hit one string softly and play another string as hard as you possibly can, both notes are going to have the same exact level of volume. The TC Electronic Hyper Gravity Compressor sports a standard level, attack, sustain, and blend, but also allows musicians to choose between vintage, TonePrint, and Spectra modes! What’s really cool about the TC Electronic Hyper Gravity Compressor is that the TonePrint mode allows you to create your own compression form. Using a program, you can then upload your own compression curve onto the pedal! What is a volume pedal? If you’re looking for a pedal that will help you to control your volume to be able to fade-in or swell, a volume pedal is a great replacement to use instead of a volume pot. They’re a very simple pedal and don’t change the overall tone of your guitar. 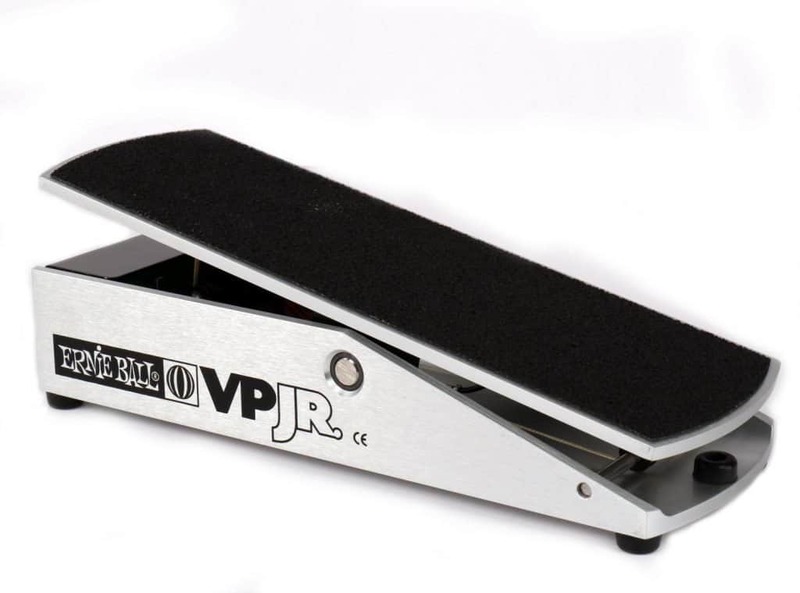 The Ernie Ball volume pedal is one of the most trusted guitar pedals for a lot of famous guitarists, but the Ernie Ball VP JR. pedal is a miniaturized version of this famous pedal. A lot of volume pedals can be girthy and take up a lot of space on a pedalboard, but this VP JR. pedal will help to save some space (without sacrificing quality) on your pedalboard! Okay, so now I know about all of these different types of pedals and what they do… now what? How do I pick the best guitar pedal for my needs? For the majority of guitar pedals on the market (no matter what type of effect the pedal produces), there are going to be people who completely love or completely hate the said pedal. It’s always a smart decision to go through and read reviews on the guitar pedal that you’re interested in, that way you have a better understanding of what strengths (and weaknesses) of the pedal will compliment/hinder your strengths and weaknesses as a musician. Use this article as a point of understanding what each guitar pedal is used for and what it’s capable of; in that sense, don’t go shopping around for a pedal that equalizes the volume for all of the notes you play if you aren’t interested in achieving the effect with your sound. When you are doing research for a new guitar pedal, if you’re looking for something that’s reliable, I would highly recommend looking for a pedal based on reputation. Look at the age of the guitar pedal and the popularity of the guitar pedal; if the guitar hasn’t been around for a long time, chances are not a whole lot of people have gotten around to testing out the pedal. You’re going to want to invest your money into a guitar pedal that’s been around for a long (or longer) time, as you’ll get a greater understanding on how the said pedal has influenced music (or certain genres or styles). Even if a guitar pedal has been around for a while, you’ll also want to do some research to see what the majority of other musicians say about a pedal. An older pedal is going to have had a lot of exposure to the guitar community, meaning that chances are there have been a lot of people who have reviewed the video. 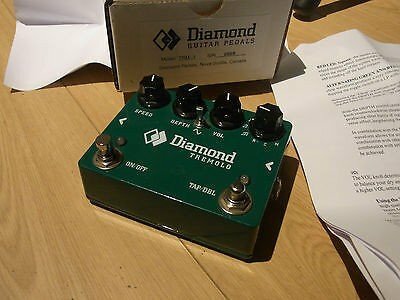 If a pedal has been out for a few years and isn’t very popular or has a lot of bad reviews, I wouldn’t risk your money. This doesn’t mean that if a pedal has a couple of two-star reviews, to stay away entirely from the pedal. But, if there are a lot of problems, complaints, or poor reviews in both the blogging world and the world of YouTube, I would recommend looking into a different pedal. Also, while it may be unheard of, any quality guitar store will let you try out their guitar pedals before you buy. Before buying, go to a guitar store and test out a guitar pedal (or a few that you’re interested in) before committing to purchasing one. Make sure to bring your personal guitar with you, just so you’re comfortable with an instrument, while you’re testing out guitar pedals. That’s why I would highly, highly recommend looking into trying out some pedals in store. That way, you’ll have a personalized, one-on-one experience and understanding of what the pedals you’re interested in using will do with your sound, for better or for worse. The world of guitar pedals can be extremely exciting, especially if you’ve never had the chance to play around with all of the different ways you can alter your sound. You may even run into a problem that a lot of other guitarists run into- a desire for an endless number of pedals. Even if you’re just getting started in the world of guitar, we all know that the guitar buying process can be super stressful. Shopping around for a guitar pedal should be a lot more fun, as you get to experiment with all of the different routes you can take your sound and music. Shop around a little and play around, even more, the perfect pedal for you to use is out there for you!